FBI Agent Heads To Trial, Accused Of Lying About Deadly Malheur Shooting W. Joseph Astarita was part of a team that was trying to capture leaders of the militia that launched the 41-day occupation in Oregon. Prosecutors say he fired his weapon but said he hadn't. The Jan. 26, 2016, shooting incident at the center of Joseph Astarita's trial was captured on an FBI video. W. Joseph Astarita was a member of the FBI's Hostage Rescue Team, which is described by the bureau as the "federal law enforcement's lead counterterrorism tactical team." According to federal prosecutors, he was trying to capture the leaders of the 41-day occupation organized by members of the Bundy family. Tensions reached a head on Jan. 26, 2016, when law enforcement attempted to stop and arrest several militants driving in two cars between the refuge and Oregon's Grant County. The occupants of one of the cars were arrested. 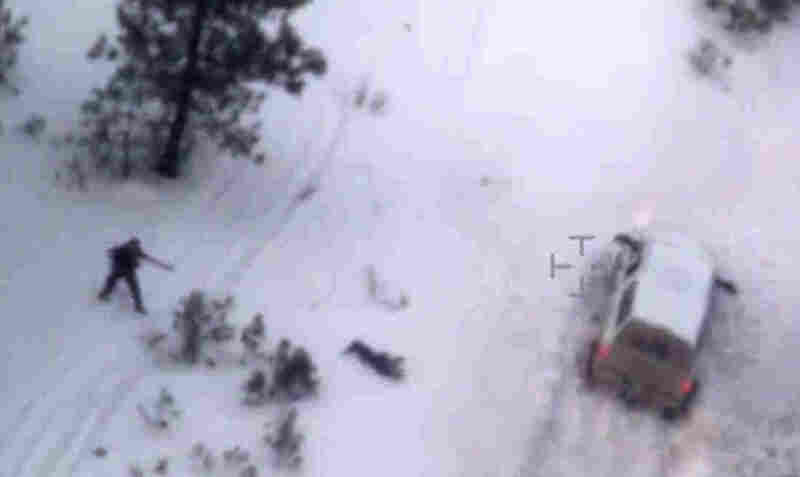 Robert LaVoy Finicum, who had been acting as the group's spokesman, was driving a second car and sped down the street as FBI agents and local police gave chase, according to the indictment. He tried to avoid a law enforcement roadblock and drove off the road, hitting a snowbank. "You back down or you kill me now, go ahead, put the bullet through me," Finicum said in a video recording of the incident taken by another militant, as NPR has reported. "After failing to follow multiple commands to put up his hands, Robert LaVoy Finicum was shot by Oregon State Police personnel while attempting to reach for a firearm inside his jacket," the indictment reads. "The defense argues the government's case lacks eyewitnesses, ballistics evidence and video showing Astarita firing," Oregon Public Broadcasting's Conrad Wilson reports. "Whether Astarita is convicted or acquitted, the Bundy family and their supporters will be able to use the outcome to amplify both Finicum's message and his place as a martyr for their movement. "In many ways, Astarita's trial is a no-win situation for the U.S. Department of Justice. If the agent is convicted, critics of the government can point to Astarita as a sign of corruption. If he is acquitted, conspiracy theories of government cover up will surely follow." An investigation by local officials into the death of Finicum deemed the fatal shooting by an Oregon State Police officer as "justified," as NPR reported, even as it suggested possible misconduct by the FBI team. Two of the remaining counts are tied to statements Astarita allegedly made to FBI supervisory special agents that he had not fired his weapon, which the indictment states were "material" to the FBI's decision at the time not to launch an investigation into an agent-involved shooting. Finally, he is charged with obstruction of justice because he allegedly failed to disclose to Oregon State Police that he had fired his weapon. As NPR's Colin Dwyer has reported, multiple attempts to prosecute Bundy brothers Ammon and Ryan have failed. In 2016, they were acquitted for their role in the Malheur occupation. "While two of their fellow occupiers were later convicted on federal conspiracy charges, the brothers Bundy had successfully argued that they were simply exercising their First and Second Amendment rights during that 41-day standoff," Dwyer said. At the center of both disputes is the Bundys' opposition to the federal government's control of public lands.